When recording a lecture, consider the location of the Swivl and the size of your video. Here are some tips and tricks for capturing a quality lecture video. 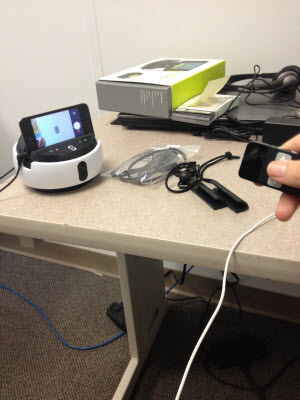 Step 1:Follow the instructions in the Setup article and open the Swivl App. Step 2:Press the desired Capture button (Capture Video or Capture Video + Slides) and make sure the iOS device is using the front facing camera. Step 3:Press the Record button on the screen once. The button will blink red. Alternatively, if the marker is synced via bluetooth to the iOS device, you can begin recording by pushing the Record button on the marker. For information on how to sync the marker via bluetooth, see the iOS Devices page. Step 4:You are now recording. Speak into the marker and deliver your lecture. Note: Hold the marker at least five inches away from your mouth when speaking to avoid heavy breathing noises and poor quality audio. Step 5:Either carry the marker as you would a microphone or attach it to the provided lanyard and wear it about your neck during your lecture. If wearing it, it should sit at the breastbone. 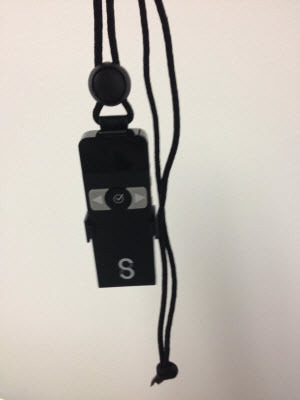 Note: The marker works best if the microphone section is pointed up while in use on the lanyard. 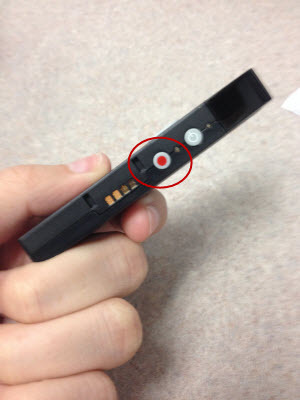 Step 6:Press the Record button on the iOS device or marker again to stop recording. The blinking button will stop and the recording will be done. 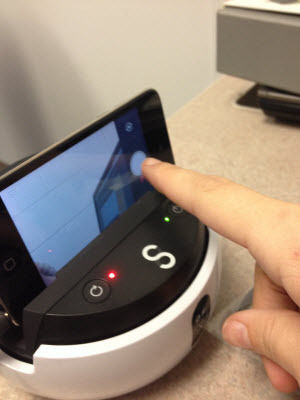 Note: If the marker is not responding, push the Record button on the iOS Device to stop recording. A new feature recently released by Swivl, using the Swivl marker you can now pause tracking to focus on a white board or take a quick 360º video of the room. This new feature is completely optional and requires adjustments to settings in order to function. Advanced Settings are not available on the device provided by ITS. If you would like to use this feature, you must use your own device to record. If using an iOS device, you must be able to upgrade to iOS 7. Step 1:In the Swivl app on your device, select Settings.Step 2:Choose Advanced. Step 3:Under Check Mark Action select the function you would like to use: Slide View, Pause Tracking, or 360º Video.ITS recommends using the Pause Tracking function. Step 4:During your presentation, simply press the Check Mark button on the marker to stop the Swivl from tracking movement.Step 5:Press the Check Mark button again to continue tracking. 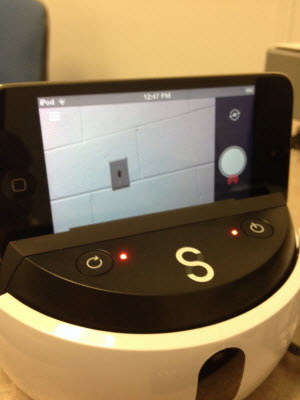 To see the official release video for the new feature, check out this video from Swivl. Tip #1:Hold the marker about four to five inches away from your mouth while speaking in order to create clear and quality audio if utilizing the handheld option for recording.Tip #2: Solid color clothing shows up best on video. Wearing very shiny jewelry or brightly colored prints can create a blurred effect when the moving on screen. Tip #3:Avoid recording in dimly lit rooms or with lights off in the classroom. Natural light may be enough to see clearly in the classroom but keeping the classroom lights off has a negative effect on video quality.Tip #4:Avoid filming in areas of direct sunlight.Tip #5:Stay away from using high powered studio or photography lights while recording.Tip #6:Make sure that there are no mirrors in the line of recording.Tip #7:The Swivl should have a straight line of sight to the instructor, even when it rotates. If there is a laser pointer, smart watch, laptop, podium, etc. between the Swivl and the instructor, it will be unable to track the marker and will turn to the left in an attempt to find it.Tip #8:Placing the Swivl in the center of the class with a tripod has the best results with tracking the marker. Placing Swivl further back reduces the movement and adjustment required by device during the presentation. This reduces the annoying movement noises. 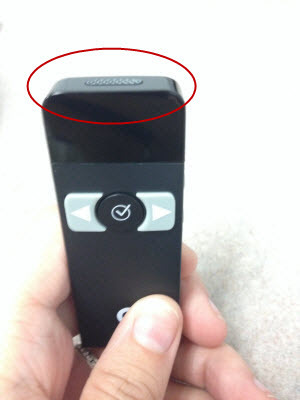 Tip #9:Do not point the device directly at a projector as the light may interfere with recording.